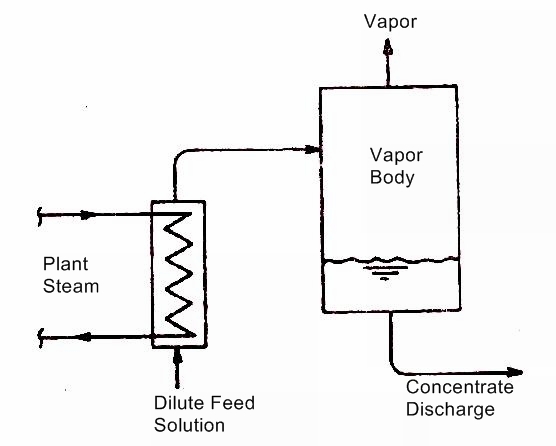 Evaporation process and Evaporators terminology. In this article we are going to discuss what is evaporation process?, its definition, types of evaporation processes. Evaporation process may be defined as a process in which aqueous solution is concentrated in a vessel or group of vessel in which concentrated solution is the desired product and indirect heating (usually steam) is the energy source. Evaporators can be arranged in forward-feed, reverse feed or parallel feed. vapors of the previous stage is the energy source for a next stage . The efficiency of the evaporators can be increased by arranging number of evaporators in series. Following are some of the basic terms used in the evaporation process. In single effect evaporation process the dilute solution which is to be concentrated is contacted only once with the heat. 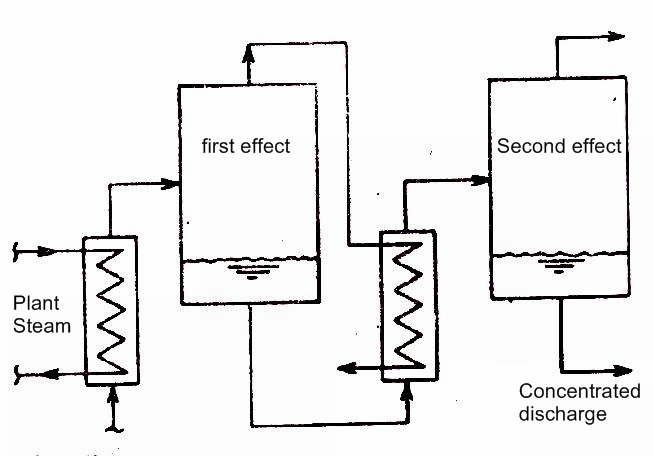 Following figure shows the single effect evaporation process. Multiple effect evaporation is the process of evaporation in which the vapors coming out in the one stage is used as an energy source (as a heat) for the next stage. In short, vapors of first stage are used as energy source for the next stage. Examples: 1) In paper industries for Kraft liquor concentration six-effect evaporators are used. 2) 20 effect evaporators are used in desalinization plants. Following figure shows the two stage evaporator. It may be defined as the difference in °F of boiling point of constant composition solution and boiling point of pure liquid at the same pressure. Economy of evaporator may be defined as the amount of steam used and is expressed in pounds of vapors produced per pound of steam supplied to the evaporator train. Capacity of evaporator is measured in terms of its evaporating capability. It is the pounds of vapor produced per unit time. Steam requirement = Capacity ÷ Economy. In evaporator if the feed and steam follow parallel path (i.e. in same direction) through the evaporator train. The feed and steam enter the evaporator train at opposite ends. Working of hydroelectric power plant. Construction and working of thermal power plant.